This little teeeeeny thing was brought in a couple of days ago, covered from head to toe with muck. He had to have a bath, and then was put into our special neonate cage, where he warmed up quickly. Ruth, who is one of the heads of the Foster Program, said she is so grateful for the cages because they keep the kittens at an even temperature and are safe. No bars to get stuck in, and she doesn’t have to keep worrying about the little guy. He took the bottle right away, and went home with one of the staff who will foster him until he's adoptable. So many of the HS employees foster animals, too. I love their devotion. 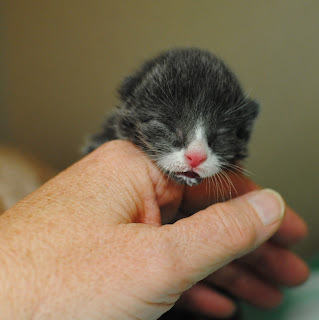 I know it's always nice see the faces of the cats and kittens you help with your donations, especially when they are as adorable as this, so here you go, take a look at this cutie! 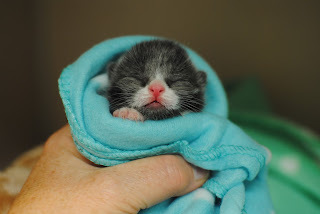 Thank you providing a nice warm cubby for this kitten and all the other things he needs to get started in life. 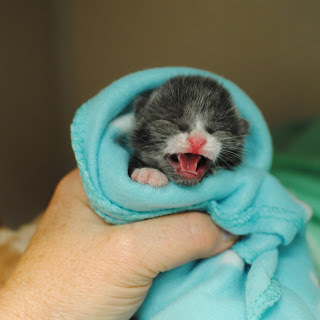 Thank you, Marguerite, for sharing this kitten's story with us and the adorable photographs, too! To support the shelter that give wee kittens like this a great chance at a very bright future, please visit our Firtstgiving Page and make a tax-deductible donation. Thank you! Our donations are currently being matched by a very generous donor, Cynthia, so for every dollar you give, she will double it until we reach the $5000 cap, or until 5:00 PM Pacific Time, which ever happens first. It's our last day of fundraising, so I hope you take a moment to give today. Thank you! Oh my- what an adorable little kitten. Wow that's tiny! Approx. how old is it? Under a week I'm assuming but I don't know much about kitten size/development when they're that young. Maybe 5 days, I would guess. I hope we get to see this kitten again when he's bigger. He has a super cute pink nose and a lot of attitude.